A mantis shrimp displaying its meral spots, visible as two purple dots. Mantis shrimp, often brightly colored and fiercely aggressive sea creatures with outsized strength, use the ultraviolet reflectance of their color spots as well as chemical signals to assess the likelihood of victory in combat, according to research led by a Tufts University doctoral candidate. The findings, published today in Royal Society Open Science, mark the first time that researchers have demonstrated that mantis shrimp (Neogonodactylus oerstedii) use both color and chemical cues when fighting over resources. 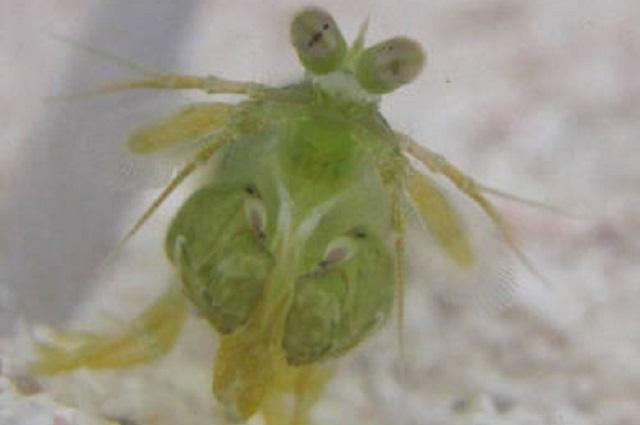 "Mantis shrimp, or stomatopods, are well known for aggressive temperaments and complex visual systems, but until now we've known very little about whether and how they use color to communicate with other mantis shrimp," said Amanda Franklin, a Ph.D. student in the biology department of Tufts University's Graduate School of Arts and Sciences and the first and corresponding author on the paper. "Our experiments demonstrate that they use a complex signaling system that combines the UV reflectance of an important spot of color as well chemical cues to help them judge their opponent's state of aggression, fighting ability and the presence of a stomatopod in a refuge." Mantis shrimp live in cavities in coral rubble or rock where they hide from predators, process food, mate and brood eggs. Because of the importance of their refuges, they are known to fight aggressively for them, punching and lunging at each other. The punch of certain types of mantis shrimp is strong enough to break glass. The creatures' vibrant colors and their warlike nature have attracted a devoted following of enthusiasts. Before fighting, mantis shrimp typically perform a threat display which shows their meral spots -- a patch of bright color on each of their club-like raptorial appendages. Researchers put sunscreen on the meral spots of some shrimp to temporarily dim the spots' UV reflectance, then staged fights. (Mantis shrimp were not injured as a result of the experiments.) Mantis shrimp that perceived an opponent's UV reflectance as low were more willing to fight and to escalate contests more quickly, suggesting that the spot enhances the threat display and provides valuable clues about an opponent's level of aggression. Researchers also temporarily dulled the ability of some of the mantis shrimp to detect chemical cues. Without the benefit of chemical signals, mantis shrimp approached an opponent's refuge more quickly and behaved less aggressively, suggesting that the chemical cues help them assess the size of an opponent and determine if an opponent is inside their dwelling. Color and chemical signals enable mantis shrimp to avoid fights that they would likely lose, said Franklin. She and her fellow researchers hypothesize that mantis shrimp use chemical cues first to determine the presence of an opponent, and then continually flick their antennae throughout a fight to evaluate changing chemical signals. Meanwhile, UV reflectance enhances the visibility of the meral spot and the threat display, from which an opponent can estimate the ferocity of the pending fight.